Mushrooms are so beefy and delicious. This is a great quick supper for meat-free-ers and meat eaters alike because it is hearty. To round out the meal, serve with simple green salad dressed with Dijon dressing or, sliced apples or pears. This recipe yields 4 (12-inch) French bread pizzas. 1. Wipe mushrooms clean with a damp towel. Slice the mushrooms. Heat a deep skillet with extra-virgin olive oil and butter over medium heat. When butter melts into oil, add bay, garlic and mushrooms. Cook until mushrooms are dark and tender, 12 to 15 minutes. Season the mushrooms with salt and pepper and add wine. Deglaze the pan with wine, eyeball the amount. Shake the pan and add the Worcestershire and thyme. Turn off heat. 2. Preheat broiler and split the loaf lengthwise and across. Hollow out a bit of the soft insides. Toast the bread lightly under broiler. 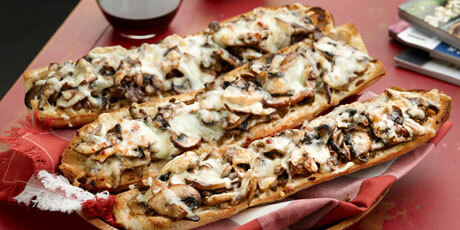 Fill bread with mushrooms evenly then top with cheese liberally. Melt cheese until it browns and bubbles then remove the pizzas from the oven and turn off the broiler.